It was a very mixed week for US equity indexes, with net weekly changes ranging from +2.3% (Nasdaq comp'), +0.5% (sp'500, R2K), to -0.8% (NYSE comp'). 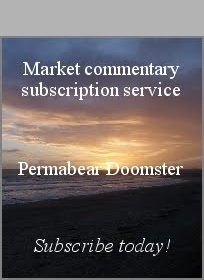 Near term outlook offers chop into the FOMC of Sept'21st. 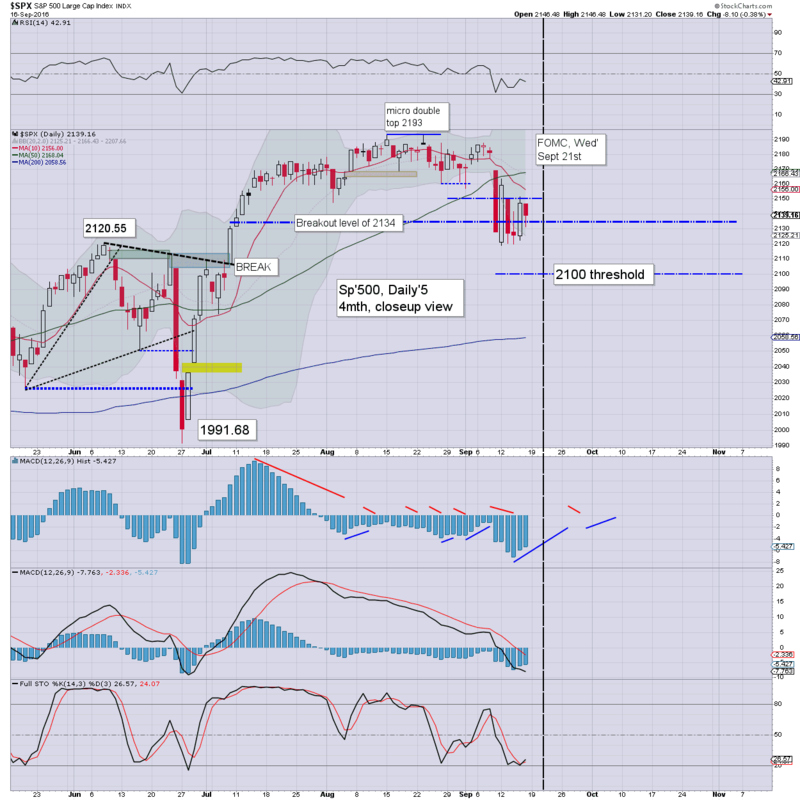 From there... assuming no rate hike, the market should resume higher, as the sp'2200s remain due. The sp' opened the week at 2119, then reversed with a hyper-ramp to 2163, but settling +11pts (0.5%) at 2139. Underlying MACD (blue bar histogram) ticked lower for a sixth consecutive week. 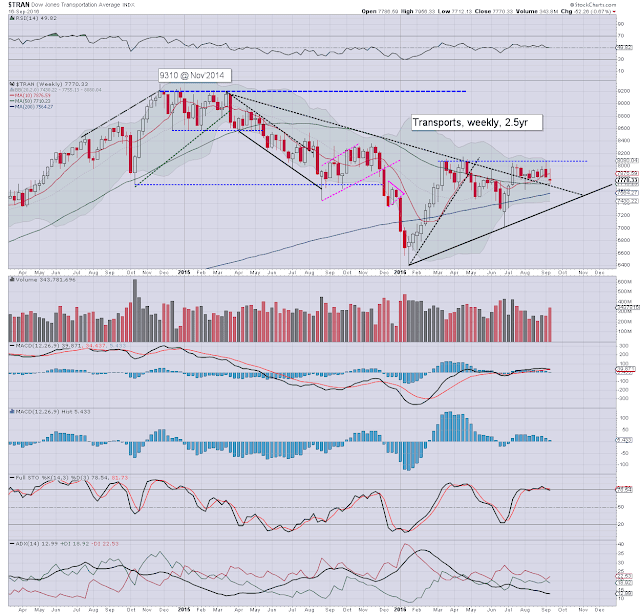 Rising trend from the Feb' low - as of next week, will be around the 2100 threshold. If 2100 fails to hold, next key support are the 2050s. Any sustained price action in the 2050s or lower, would bode EXTREMELY bearish, as other indexes would also be breaking their respective rising trends and multiple aspects of support. Best guess: no rate hike until the Dec' FOMC, with equities rising into end month... and broadly all the way into spring 2017. Equity bears can not justifiably get confident, unless the market puts in a few daily closes in the 2050s or lower. If that happens, then talk of 'autumnal/winter' upset to the 1600/1500s would become a valid scenario. It was the best week for tech since late June, with the Nasdaq settling +2.3% @ 5244, a mere 43pts shy of the recent historic high. 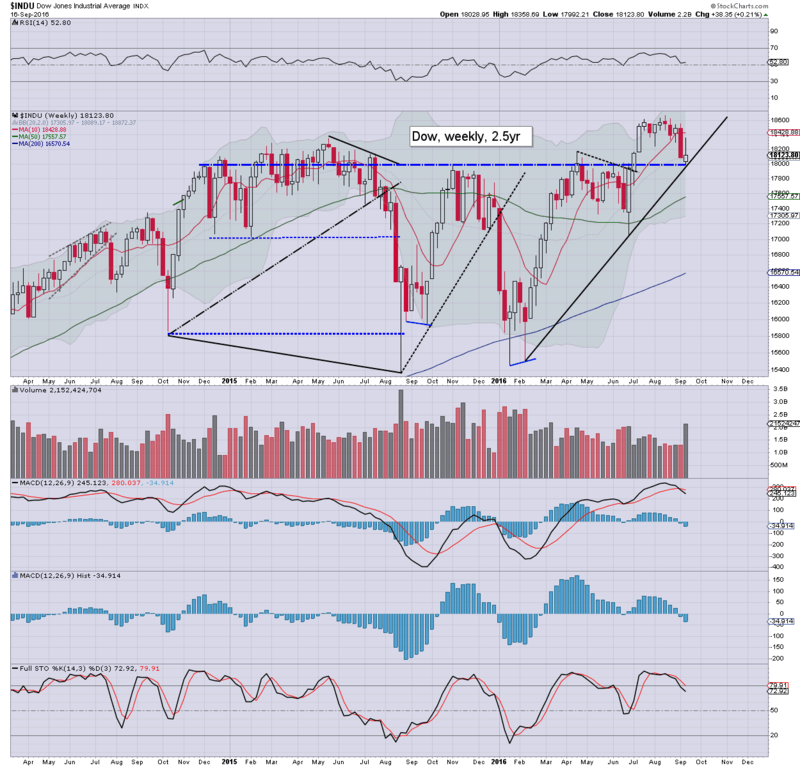 The upper bollinger will be offering the 5400s into end month. Any Sept' or Oct' close in the 5300s should be enough to begin awakening the mainstream to the notion that the 6000s are a valid target for late spring/early summer 2017. Equity bears need to see a break below the 5000/4950 support zone, to become confident that the market will unravel this autumn. Right now, that seems extremely unlikely, as Q3 earnings will likely come in at least 'reasonable'. This week's very significant gains in tech behemoths - AAPL and INTC, of 11.4% and 6.3% respectively, bode well for the broader market. 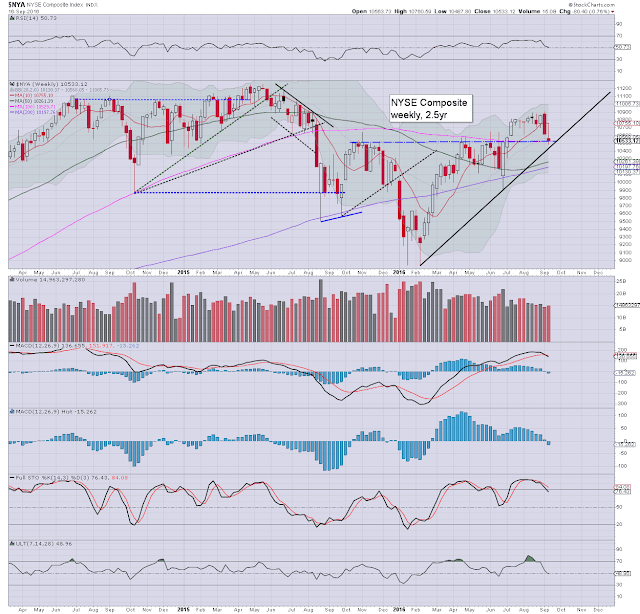 The mighty Dow saw a minor net weekly gain of 0.2%, again settling above the key threshold of 18k. As of next week, rising trend will be around 18k. If there is a failure, first downside target would be the 17500/400 zone. The BREXIT low of 17063 looks extremely difficult to reach, even if the fed raise rates. The master index settled -0.8% in the 10500s, which is a key price cluster area. Rising trend will be 10500 next week. If it holds, first upside target for the autumn is the 11k threshold. The May 2015 high of 11254 is within range by year end. The second market leader - R2K, settled +0.5% @ 1224, having managed to hold the 1200 threshold. Rising trend will be around 1180 next week, so the bulls have almost 4% of downside buffer before any serious technical damage. A break >1240 would be bullish, and bode for another run to challenge the June 2015 high of 1296. A year end close in the 1300s is well within range. 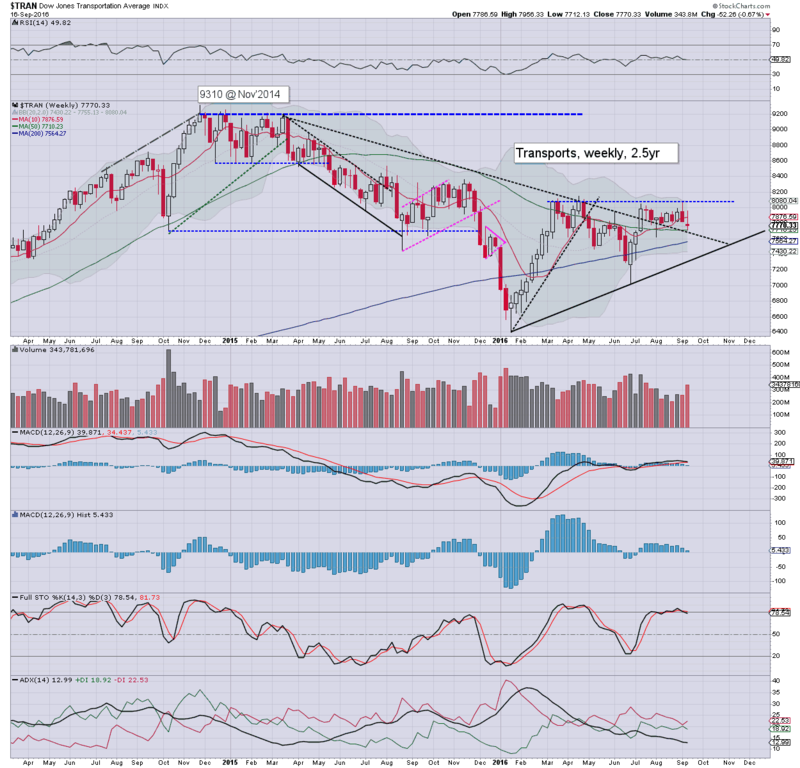 The 'old leader' - Trans, saw a net weekly decline of -0.7%, settling @ 7770. The 8K threshold remains strong resistance. 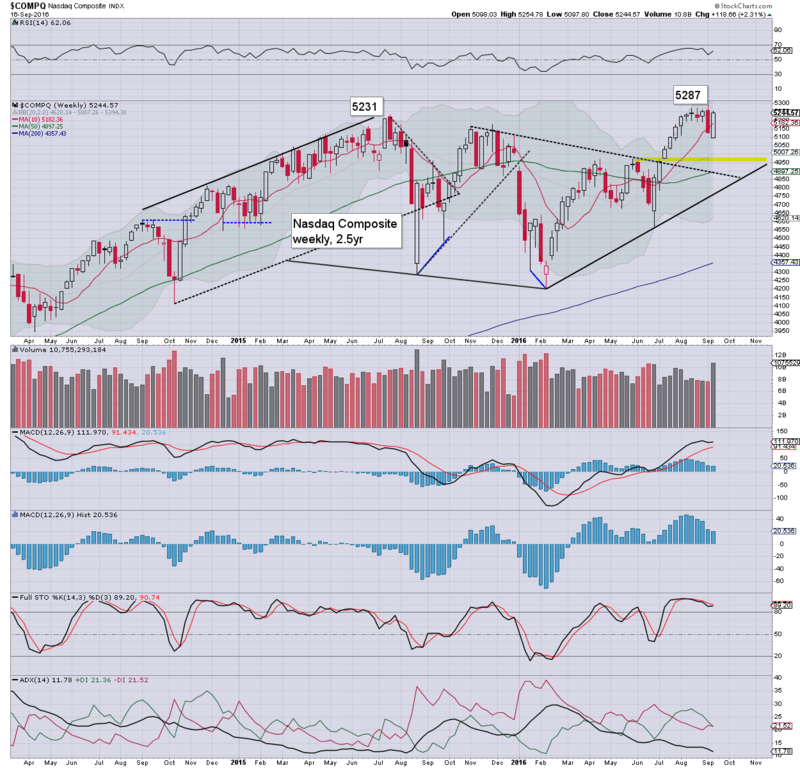 Rising trend will be in the low 7300s next week, and that is around 5% lower. Those equity bulls seeking broader market strength into year end, require a break above the April high of 8149. Based on the past four months of price action, that will not be easy. Despite some ongoing weakness, all US equity indexes are holding rising trend from the Jan/Feb' lows. Most indexes (Transports is the exception), are broadly building a series of higher highs and higher lows. 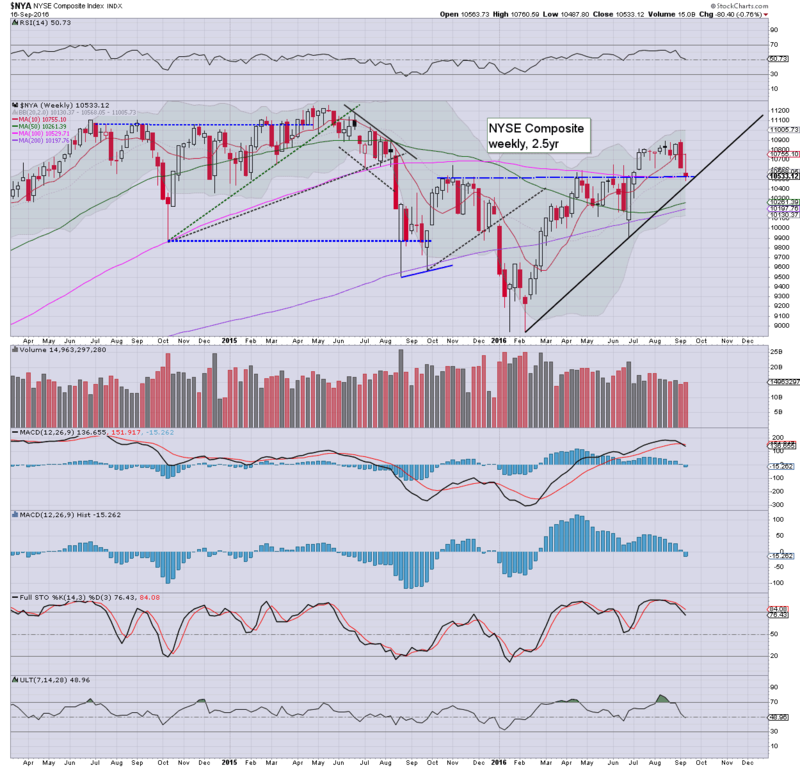 The headline indexes - sp/dow/nasdaq, could easily break new historic highs in the near term. The R2K is next to follow. 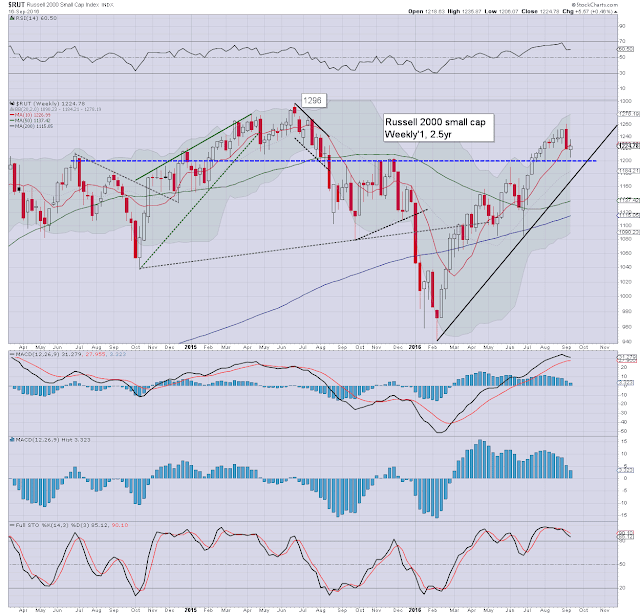 If rising trend is broken, there is a viable 3-4% downside, before causing any critical technical damage, which would merit 'alarm bells', such as the sp'2050s. FOMC announcement @ 2pm. The market is very mixed about whether the fed will raise rates. On balance, a 'no change' outcome would be a relief to the market, and offer a valid excuse for renewed equity upside. *there is a fed conf', with Harker, Lockhart, and Mester on Friday @ 12pm. That will no doubt get at least some media attention. US equities closed moderately weak, sp -8pts @ 2139 (intra low 2131). The two leaders - Trans/R2K, settled lower by -0.4% and -0.2% respectively. 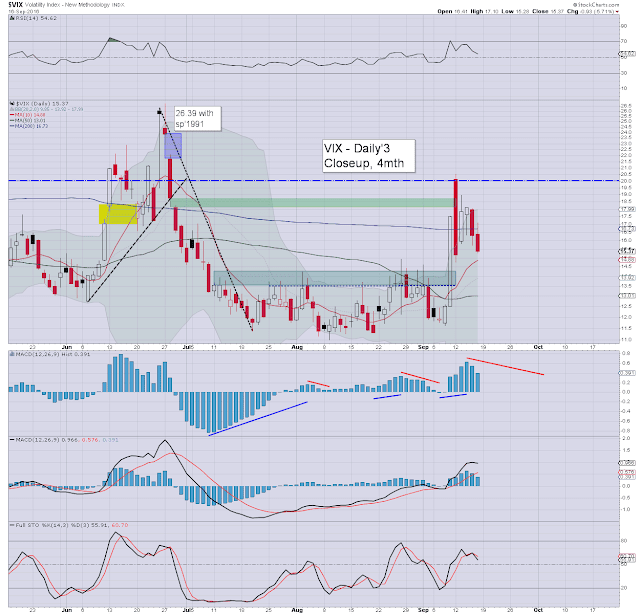 VIX settled -12.2% @ 15.37. Near term outlook offers further chop, with the market set to remain broadly stuck within the 2120/50 zone, until the FOMC announcement. Quad-opex naturally saw a lot of chop, leaning on the moderately weaker side. However, the VIX did reflect underlying market confidence, as it cooled into the weekend, which resulted in a significant net weekly decline.. having briefly seen the 20s in pre-market on Monday. 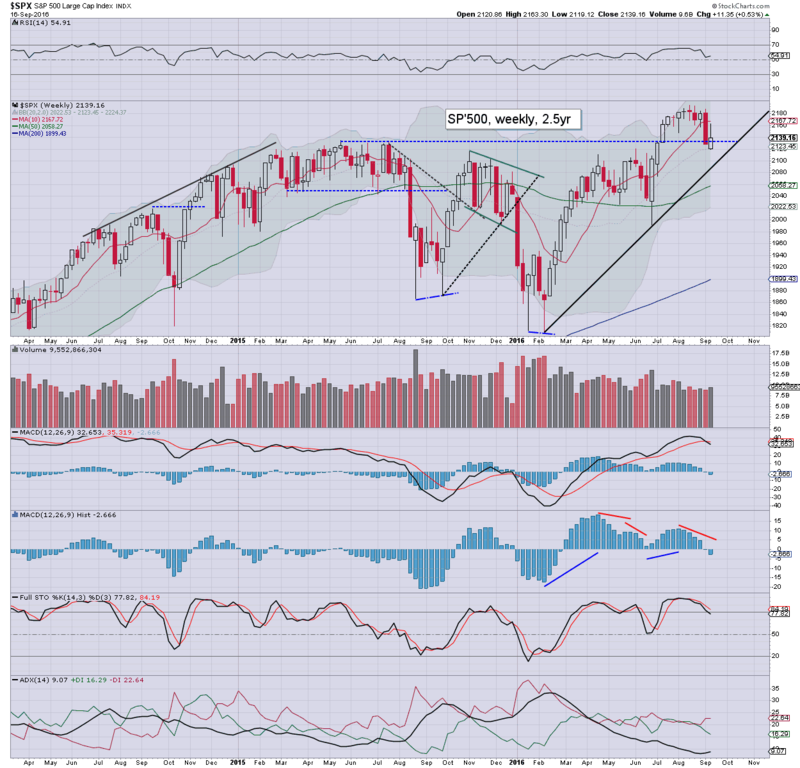 I will note there is a threat of the sp'2070/50 zone - where there are multiple aspects of support. That would likely require the fed to raise rates next Wednesday, and frankly.. that just doesn't seem at all likely. I remain of the view the fed won't raise until the Dec' FOMC, which would be a far simpler time, not least as the US election will be out of the way. A net weekly gain of 0.8%, settling at DXY 95.99. RE: H/S scenario. Any break above DXY 96.25 next week would provisionally trash the scenario. A break <94.75 would break the mid term rising trend from May, and would open the door to the 92.00-91.50 zone before year end. My best guess remains the same... no rate hike until December. If correct, it'd give the USD the excuse for further cooling across Oct/early Dec', before a bounce into early 2017, and then significant weakness across the summer/autumn. 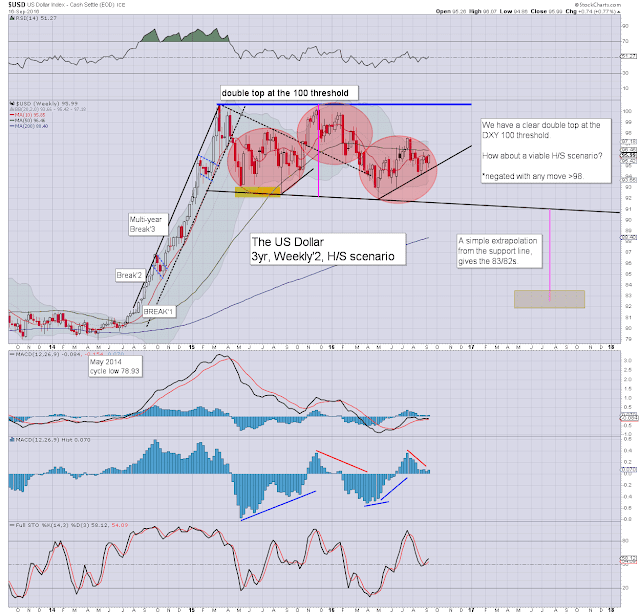 By definition, the H/S scenario offers the DXY 83/82s. 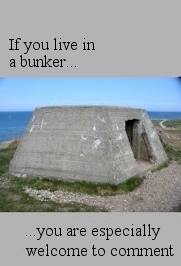 I understand how that could be seen by many as crazy talk. First things first... lets see how the USD trades with next week's Fed decision.